One of the biggest challenges for entrepreneurs can be turning your ideas into plans. You might think that you have a solid idea, but getting your thoughts written down and worked out can be a lot more complicated. From ideas for new businesses to concepts for new products and services, creating a coherent plan can take weeks or months. Lean Canvas is a planning method that helps you to get to the heart of your idea. It puts everyone on one page, helping you to set out the key information that you need, without any of the unnecessary details. 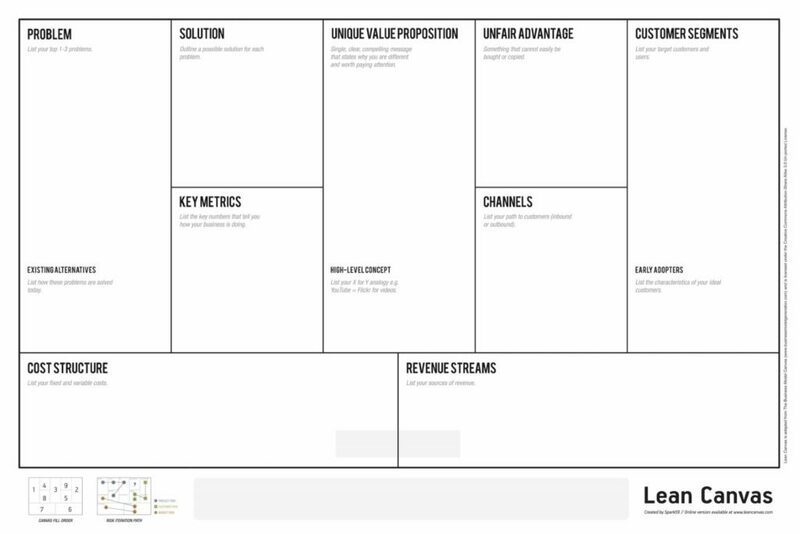 Lean Canvas is a one-page business plan method created by Ash Maurya, which is adapted from the Business Model Canvas by Alexander Osterwalder. The plan features a number of blocks to help you map out some key points that will help you turn a business idea into something more concrete. The Lean Canvas is created especially for entrepreneurs to make it easier for them to get a clear and simple idea of what they’re doing. Understanding the key problems of your customers is essential. You use this section to list the top problems that your different customer segments experience that you’re aiming to solve. Understanding who your customers are is a vital step. You can’t know what their main problems are if you don’t know who they are. In the customer segments section, you need to write down who your target audience is, which might include several customer segments. Your customers and their problems are tied together, so you will probably need to think about both at the same time. This section sits in the middle of the canvas because it’s what you are proposing to offer to your customers. It sets out the unique value that your business will provide. You need to think about what makes your brand, product or service different from others who are trying to solve the same problems as you. What’s the answer to your customers’ problems that you’re going to offer them? You won’t always have the perfect solution right away, but the purpose of creating a business plan is to help you get started. If you want to find the solution to your problem, don’t assume it will just come to you. Talk to your customer segments to find out what they want and need. What channels are you going to use to reach your customers? These are the marketing and advertising methods that you’re going to use, from digital marketing such as SEO to more traditional channels, like radio, print and TV. Where is your money going to come from? How are you going to price your products or services? Your pricing model is an important part of what you’re offering, and it’s something you’re going to need to research and test. How much are people willing to pay, and what’s the minimum you can charge to meet your goals? These are the costs that your business will have in order to run and market your product. It could include market research, technology, staff costs, and more. With an idea of your one-off and recurring costs, you can try to work out a rough estimate of how many customers you will need to break even. Your key metrics are what you will use to monitor how your business is performing. You can identify some key activities that you want to watch closely to see how people are interacting with and using your business and its products/services. Your unfair advantage is what you have that no other business has. It can’t be copied or bought, so it will help you to stand out from the rest. This is the last step in the process and is often the most difficult. Your unfair advantage could be many things, from an unbeatable staff to endorsements from experts. It’s worth taking time to think about it and identify something that you can do that others can’t buy. The Lean Canvas isn’t something that you should be spending hours on. In fact, you should be able to get some ideas down in around 20 minutes. Of course, you won’t have all of the information you need right away. But the canvas will help you to decide whether your business idea has legs and what your next moves should be. 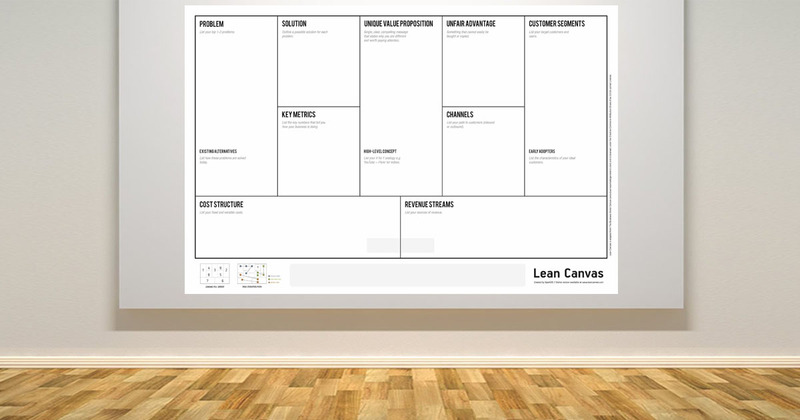 The Lean Canvas is adapted from the Business Model Canvas, which uses a similar principle. However, the Lean Canvas aims to cut out even more of the unnecessary information and time-consuming tasks. Lean Canvas was first set out by Ash Maurya, author of the book Running Lean, in 2010. Maurya is an advocate for lean startups and founder and CEO of Leanstack. While the business planning method has not been around for that long, many entrepreneurs and lean business fans, have taken to using it. It is also used by universities, accelerators and various groups that are part of large organizations. Even the concept of Lean Startup hasn’t existed for long in the great scheme of things, so the Lean Canvas is a relatively well-established tool. The Lean Canvas plan is adapted from the Business Model Canvas. The Business Model Canvas was proposed by Alexander Osterwalder in 2008 and has since been adapted for various niches. There are a few key differences between the Business Model Canvas and the Lean Canvas, although both are intended to help with lean business planning. The Business Model Canvas has sections for key partners, such as suppliers, key activities, key resources and customer relationships. Like the Lean Canvas, the Business Model Canvas also has sections for customer segments, channels, revenue streams and cost structure. Ash Maurya says that when creating the Lean Canvas, his focus was on making it actionable by identifying what was most risky to a business. Upon reflecting on Business Model Canvases that he had made before, he realized that he had left out some high-risk issues, while some of the things he had put on the canvas didn’t seem high risk enough. Maurya got rid of some of the main boxes in the Business Model Canvas and added the problem, solution, unfair advantage and key metrics boxes. He removed the key activities and key resources boxes because he felt that they were more useful to help other people understand the business, and not for the entrepreneur to understand what they were doing. As he thought that former customer relationships could fit into the channels box, this box was removed too. Maurya was unsure about removing the box for key partners but ultimately decided that any risk related to partners would fit into the cost structure and channels boxes. The added boxes are intended to make it easier to identify a problem and find the solution, leaving only a small amount of space to condense your ideas down. This is done on purpose so that entrepreneurs don’t end up going too in-depth and getting lost in details that don’t matter yet. The key metrics box forces the entrepreneur to find the most important actions or metrics that they need to monitor and measure. There are various benefits to using the Lean Canvas model to plan out a business idea, both on its own merits and when compared with the Business Model Canvas. Firstly, the Lean Canvas is designed for entrepreneurs. Like other versions of the Business Model Canvas that have been adapted for different niches, it has been mapped out with entrepreneurs in mind. The examples used for the Business Model Canvas when it was released were all existing and successful businesses, making it difficult to apply to a new business idea. With the Lean Canvas, entrepreneurs can focus on identifying problems and solutions. It’s designed to work for a startup mindset and help entrepreneurs build on their ideas. Having the unfair advantage section as part of the canvas allows entrepreneurs to ensure they have something that will help them stand out. Not only will they have their unique value proposition, but they will identify the one thing that no other brand will be able to do in exactly the same way that they do it. The lean design and the limited boxes of the Lean Canvas are easy to understand, and they encourage entrepreneurs to think carefully. There’s only so much space to use, which means it’s essential to boil down key points into the most important information. It recognizes that the business plan is for the entrepreneur and is rarely shown to other people. It doesn’t need to be extremely detailed when the point is to get to the key things that matter when creating a business plan. It’s easy to start creating a lean canvas and filling it out. You could do it alone or work on it with a business partner. Print it out onto a small piece of paper or draw it onto a whiteboard to make it more visual. You can use any medium you want to complete it. It depends on what feels most natural and useful for you. If you find it useful, there are online tools available that make it easy to create a Lean Canvas on a computer or other device and perhaps share it with others. Some people prefer a physical version, but a digital product can also be fun to use and easy to create. Some people use only the Lean Canvas design, while others choose to put together a Business Model Canvas too. They can both be helpful in different ways. However, you can successfully use the Lean Canvas model on its own. If you prefer to have a digital tool to create your business resources, there are several online tools that you might want to use. Leanstack offers a tool from the company founded by the creator of the Lean Canvas. You just need to sign up on their website, and you can create unlimited canvases and unlimited projects. There are also free courses and downloadable resources, which will help you to get more out of the tools. The main benefit of the Leanstack tool is that it helps with collaboration, reducing problems like multiple digital copies or talking over each other. If you want more functionality, you can pay to get more from the Leanstack tools. Another tool that you might want to use is Canvanizer. This gives you the opportunity to put together a Lean Canvas, but it also has several other template options. You can also create a Business Model Canvas, as well as a Lean Change Canvas, a Feedback Canvas, SWOT (strengths, weaknesses, opportunities and threats) analysis, Open Innovation canvas, Canvas4Change, and HR innovation canvas. There are also service design templates for a customer journey canvas and service blueprint canvas, plus a project management canvas. You can use the tool for free. There have been other tools available in the past, such as Leanmonitor, which are no longer running. There are plenty of places to get free templates too if you’re looking for a neatly designed resource to use. However, anyone can draw up their own canvas template if they want to. The benefit of using digital tools is that you can store them in one place and share them with whoever you want. The Lean Canvas is a useful tool for entrepreneurs who want to get their thoughts together. Turn a business idea into something actionable by working out the problems you need to address and the solutions that you’re going to present. Lean Canvas makes sure that you get to the essential points that will help you identify the most important risks you could face while starting a new business. It’s intended to take only 15 or 20 minutes to fill out a Lean Canvas, so you can have the basics of your business plan set out in next to no time at all. At Smek Digital Consulting, website and marketing projects may include a discovery phase that incorporates the creation of lean canvases for your business.